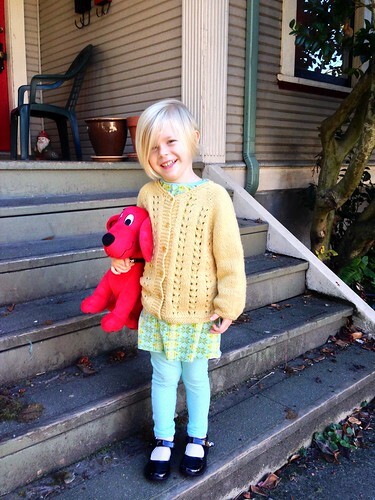 Because it seems to be yellow week around here, I’ll show you one of Kit’s new sweaters. Normally by the end of October, we are firmly zipped and snapped into our rain gear, but this year, after a strangely wet September, we have had an astonishingly beautiful October. The skies have been blue, the wind has been light, and the temps have slowly dropped from the low 70s to the mid 50s without the rain descending on us (it’s due to show up next week). There have been walks to find leaves and seed pods as they pile up on the sidewalk, trips to the playground, and lots of bike rides in the most perfect of biking weather. The sweater is knit from O-Wool in the Haystack colorway. 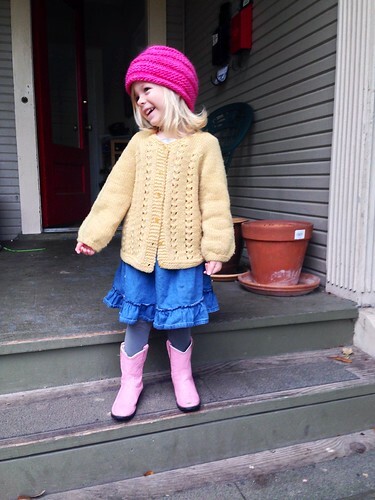 The pattern is the Sunday Sweater by Ginny Sheller. It’s the second time I’ve knit it – the other one was in a yellow Malabrigo and is now too small. Kit loves the color yellow, so she requested a new one. I found the yarn on sale at Happy Knits and bought a Kit sweater’s worth of 3 different colors. I love that this pattern is both easy and interesting. The almost pleated look of the cuff is delightful. I knit the size 2/3 but my gauge was bigger in this yarn, making it more of a 3/4, which is perfect. I added buttons all the way down so it functions more as a coat. The buttons are vintage amber glass that I also bought at Happy Knits. I have 2 more sweaters for her to show you and 2 more to knit. Wool is the key to us staying warm while we bike our way through the winter. Hopefully this will cover most of the colors of her wardrobe, so no matter what she’ll be both stylish and warm. I think we’re well on our way to a mama made wardrobe for the cold winter months. I need to break down and buy that pattern. I really, really like it. I may need an adult sized one for me at some point…. It’s a great little pattern. And if you know how to do a basic top down raglan sweater for yourself, it would be easy to incorporate the lace panels into it. I love the outfit below the best. The sweater is gorgeous! I want a close-up of the glass buttons please. I love that one too (I also made the outfit). I will get a close up of the buttons. I have 4 more of them, luckily. Lovely-the post, the sweater, the child, the photo. It’s all made of smiley-ness. Thanks Dawn! I think she’s pretty cute too.